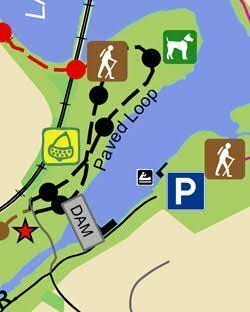 Paw Point is a membership only off-leash dog park located at the tip of the peninsula within Lake Roland. Paw Point is a short walk from the Park’s main entrance on 1000 Lakeside Drive, Baltimore MD 21210. There is also boardwalk access to the Park from the Falls Road light rail station, which provides convenient ample parking. Both the Park and Paw Point are open from sunrise to sunset throughout the year. All Paw Point dog park patrons must depart Paw Point 15 minutes prior to sunset and depart park property by sunset.